BCU uses spreadsheet ciphering to identify potential new employee group partners while KCT relies on shoe leather. When Dave Blum sizes up SEGs, he goes to the Matrix. Not the computer-driven simulated reality of movie fame, but a spreadsheet that filters potential new partners based on criteria such as employee concentration and company outlook. Targeting new SEGs is a big part of Blum’s job as vice president of corporate relationships and services at BCU ($2.5B, Vernon Hills, IL), along with nurturing existing ties to employees at more than 100 organizations including Baxter International, Boston Scientific, and Target. When he does, he consults the matrix he built as a tool for assessing potential partners. The sheet assigns 10, 7, 5, or 3 points each to a list of 10 factors to consider, beginning with whether that company competes with an existing SEG. Then there are things like employee base — a broad mix of white collar and production is most desirable — and proximity to the credit union’s 41 branches in a dozen states, 38 of which are located inside a SEG’s facility. “We need to think about whether we would have to put a contact center there or support most of the members remotely,” Blum says. It’s important that we have full senior management advocacy to help us build awareness within their company. Larger companies get more points, too, as do a consistent upward trend in employment, an excellent corporate outlook per raters like Moody’s, and commitment from the top. “It’s important that we have full senior management advocacy to help us build awareness within their company,” Blum says. Looking for a better way to select a potential new SEG? BCU shares its matrix for doing just that, and it’s easily customizable for any credit union's operation. That’s one of the many documents, policies, and templates borrowed from fellow credit unions and posted in Callahan's Executive Resource Center. The BCU executive recognizes that point assignments can be subjective, but he says the system gives him and his fellow C-suiters at the big Chicagoland credit union a good feel for the possibilities. Then, if it’s a go, it’s time to reach out. He has staff assigned to working with existing SEGs, but the initial outreach to potential new ones resides above them in the org chart. That outreach takes a distinctly retail feel at another suburban Chicago institution, Kane County Teachers Credit Union ($214.0M, Elgin, IL). There, vice president of business development Yvonne Irving keeps up with “who’s new and who’s growing” through local publications and her work with that gold standard of local business networking, the Chamber of Commerce. Irving herself is a board member for the Elgin chamber. KCT has more than 200 SEGs already in its field of membership — in addition to a community charter — and in the past few years has put a major focus on renewing its relationship with its major partners, including local school districts. But that doesn’t preclude making some nice new friends, such as two local Costcos that are among the most recent new SEGs. 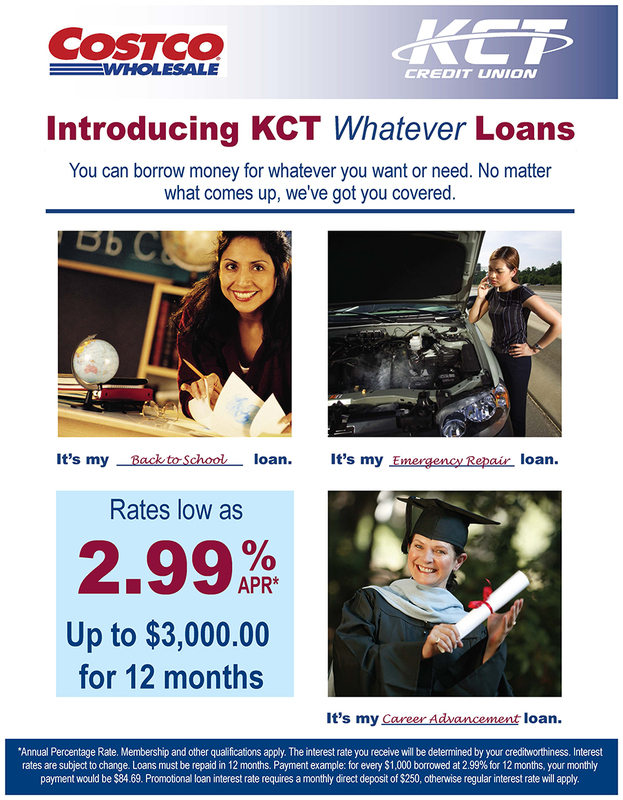 KCT targets new SEGemployees with customized collateral like this loan flyer for two local Costcos. That dual emphasis on creating new relationships while deepening existing ties has helped KCT reverse member losses while posting loan and share growth numbers that far outpace its peer credit unions. It takes work, though. Since we are community based, anyone can join. We have to sell [potential new SEGs] on the benefits of making us part of the benefits plan. But Irving doesn’t eschew community relationships for building business with SEGs and beyond. Irving says KCT tries to align with community groups similar to the credit union, such as not-for-profits, to see how they can be resources for one another.